Fuji Bikes was recently selected as one of the premium holiday giveaways on leading daytime talk show, the Ellen Degeneres Show. 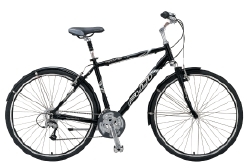 Each of the 300-member studio audience will receive a Fuji Crosstown 1.0 bike as part of Ellen's "12 Days of Giveaways" theme leading up to the holidays. The air date of the show is Wednesday, December 14th. The Ellen Degeneres Show, produced by Warner-Brothers, is a two-time Emmy award winner for outstanding talk show. The show airs five days a week and is one of the highest-ranking shows in its category. Fuji will provide each Ellen Show studio audience member with the 27-speed hybrid bike that features a suspension fork with 50mm of travel, a comfort seat post and fenders. The suggested retail price of the Crosstown 1.0 is $520. The Fuji bikes will be shown on-air and each member of the audience will be fit for their bike backstage after the show. Each audience member will also receive a year's supply of Lipton Tea. The show is being used to announce the forthcoming "Lipton Live Well Challenge," a national call-to-action campaign to encourage consumers to get healthier by enjoying three servings of tea per day and being active. "We are thrilled to be aligned with Lipton, a major food industry brand that sees the potential in cycling," says Pat Cunnane, president of Fuji Bicycles. "The Ellen Degeneres Show giveaway is the first of many great collaborations between Fuji and Lipton." TEAm Lipton: Fuji is the proud sponsor of the country's top pro cycling program, which includes the current U.S. national time trial champion and 2004 Olympian Kristin Armstrong. TEAm Lipton will be riding the Fuji Team Issue carbon framesets with a custom Lipton-inspired paint scheme. This top-level U.S. based program, run by Velocity Sports Mgt., Inc. (which also manages the Navigator's Pro Team), will mirror Fuji's commitment to Team Nurnberger of Germany with current World Champion, Regina Schleicher. BikeTown: Lipton Teas is the presenting sponsor and Fuji is a bike sponsor of Rodale's Bicycling Magazine's grassroots program to give away over 1,000 bikes to deserving consumers. Under-the-cap promotions: For a limited time during 2006, Lipton ready-to-drink teas will have an under-the-cap promotion to allow consumers a chance to win Fuji bikes. On-site promotions with TEAm Lipton athletes and their sponsors at major venues such as the NASCAR Daytona 500 and key national retailers. Fuji has been making great bicycles since 1899. Originally a Japanese company, Fuji is now a global brand with distribution in over 40 countries. Fuji is headquartered at 10940 Dutton Road, Philadelphia, PA, USA. Its parent company, Advanced Sports, Inc., is also home to SE Bikes, the classic BMX brand. For more information regarding Fuji's complete line of bikes, go to fujibikes.com.